The 25th James Beard Foundation’s Chefs & Champagne Benefit held at the Wölffer Estate Vineyard in Sagaponack drew an array of foodies in anticipation of the multi-restaurant tasting and awards ceremony. 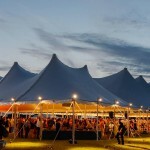 Cookbook author, Bravo’s Top Chef ‘Fan Favorite’ and co-host of ABC’s The Chew and daytime Emmy award–winning chef, Carla Hall (who’s philosophy is to always cook with love), was deservedly honored. VIPs that included Alex Guarnaschelli, Iron Chef, Chopped judge, and chef/owner of Butter Restaurant, NY; Olivia Jordan, Miss USA 2015, and Dallas Cowboys’ Tyron Smith enjoyed the sumptuous creations of more than 40 top chefs and their restaurants that included Luis Jaramillo, Blue WaterGrill, NYC; Erin Cayaban, Botequim, NYC; Jason Weiner, Almond, NYC and Bridgehampton, NY, and L&W Oyster Co., NYC along with Chris Lavey and Pastry Chef Stephen Collucci, Colicchio & Sons, NYC; while sipping Taittinger champagneand Wölffer Estate wines. Additional sponsors including Antigua & Barbuda Tourism Authority, Audi, Badoit Sparkling Natural Mineral Water, Celebrity Cruises, Eventbrite, Evian, Fossil Farms, Halstead Property, Melissa’s, Roland Foods, Royal Cup Coffee, Stella Artois,Tito’s Handmade Vodka and VerTerra Dinnerware also aided in raising funds for the educational and inspirational culinary foundation. 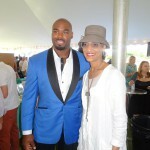 Tyron Smith (Dallas Cowboys) and Honoree Carla Hall (Top Chef) during the 25th James Beard Foundation’s Chefs & Champagne Benefit held at the Wolfer Estate Vineyard in Sagaponack. 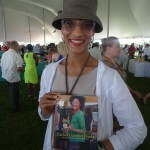 Honoree Carla Hall (Top Chef) with her cookbook ‘Carla’s Comfort Foods’ during the 25th James Beard Foundation’s Chefs & Champagne Benefit held at the Wolfer Estate Vineyard in Sagaponack.